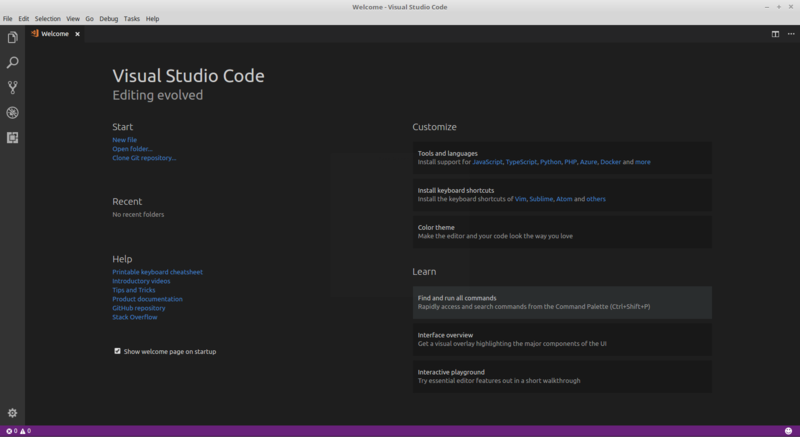 You can download the latest packages for Windows, Linux (deb and rpm, if you want even a tar ball), and Mac on the Visual Studio Code download page. Download the deb file. To install the package, open a Terminal window and run dpkg . sudo might ask you for a password. That’s it! Now you can simply start VS Code.After you have installed your favorite extensions, VS Code is ready to code. This entry was posted in Development and tagged development, linux, microsoft on October 15, 2017 by Patrick Terlisten. Beside my Lenovo X250, which is my primary working machine, I’m using a HP ProBook 6450b. This was my primary working machine from 2010 until 2013. With a 128 GB SSD, 8 GB RAM and the Intel i5 M 450 CPU, it is still a pretty usable machine. I used it mainly during projects, when I needed a second laptop (or the PC Express card with the serial port…). It was running Windows 10, until I decided to try Linux MInt. I used Linux as my primary desktop OS more than a decade ago. It was quite productive, but especially with laptops, there were many things that does not worked out of the box. Because I use PowerShell quite often, and PowerShell is available for Windows, MacOS and Linux, the installation of PowerShell on this Linux laptop is a must. Linux Mint is a based on Ubuntu, and I’m currently using Linux Mint 18.2. Microsoft offers different pre-compiled packages on the PowerShell GitHub repo. For Linux Mint 18, you have to download the Ubuntu 16.04 package. For Linux Mint 17, you will need the 14.04 package. Because you need the shell to install the packages, you can download the deb package from the shell as well. I used wget to download the deb package. The next step is to install the deb package, and to fix broken dependencies. Make sure that you run dpkg with sudo . Package liblttng-ust0 is not installed. Looks like it failed, because of broken dependencies. But this can be easily fixed. To fix the broken dependencies, run apt-get -f install . Make sure that you run it with sudo ! After this operation, 1.127 kB of additional disk space will be used. That’s it! PowerShell is now installed. This entry was posted in Development and tagged development, linux, microsoft, powershell on October 14, 2017 by Patrick Terlisten. While searching for a simple monitoring für my root servers, I’m stumbled over a python-based software called Simplemonitor. Other alternatives, like Nagios, or forks like Incinga etc., were a bit too much for my needs. SimpleMonitor is a Python script which monitors hosts and network connectivity. It is designed to be quick and easy to set up and lacks complex features that can make things like Nagios, OpenNMS and Zenoss overkill for a small business or home network. Remote monitor instances can send their results back to a central location. Monitoring is nothing without alerting, so I was pretty happy that Simplemonitor is able to send messages into a Slack channel! But it can also send e-mails, SMS, or it can write into a log file. To get a full feature overview, visit the Simplemonitor website. The project is hosted on GitHub. If you are familiar with Python, you can contribute to the project, or you can add features as you need. The installation is pretty simple: Just fetch the ZIP or the tarball from the project website, and extract it. The naming is a bit confusing. The monitor.ini contains the basic monitoring configuration, like the interval for the checks, the alerting and reporting settings. The monitors.ini contains the configuration of the service checks. That’s confusing, that confused me, and so I changed the name of the monitors.ini to services.ini. The services.ini (monitors.ini) contains the service checks. This is a short example of a ping, a service check, a port check, and a disk space check. The alerting is configured in the monitor.ini. I’m using only the Slack notification. All you need is a web hook and the corresponding web hook URL. In case of a service fail, or service recovery, a notification is sent to the configured Slack channel. To start Simplemonitor, just start the monitor.py. It expects the monitor.ini in the same directory. php_fpm is running as pid 33937.
named is running as pid 566.
fail2ban is running as pid 41306.
postgrey is running as pid 649.
mysql is running as pid 23726.
postfix is running as pid 53332.
nginx is running as pid 52736. I really like the simplicity of Simplemonitor. Download, extract, configure, run, done. That’s what I’ve searched for. It is still under development, but you should not expect that it will gain much complexity. Even if features will be added, it should be a simple monitoring. This entry was posted in Software and tagged freebsd, linux, monitoring, python, unix on May 15, 2017 by Patrick Terlisten. The browser connects to the Stunnel client on 127.0.0.1:8080. This is done by configuring 127.0.0.1:8080 as proxy server in the browser. 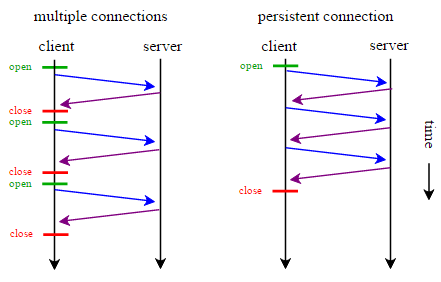 The traffic enters the tunnel on the client-side, and Stunnel opens a connection to the server-side. You can use any port, as long as it is unused on the server-side. I use 443/tcp. The connection is encrypted using TLS, and the connection is authenticated by a pre-shared key (PSK). 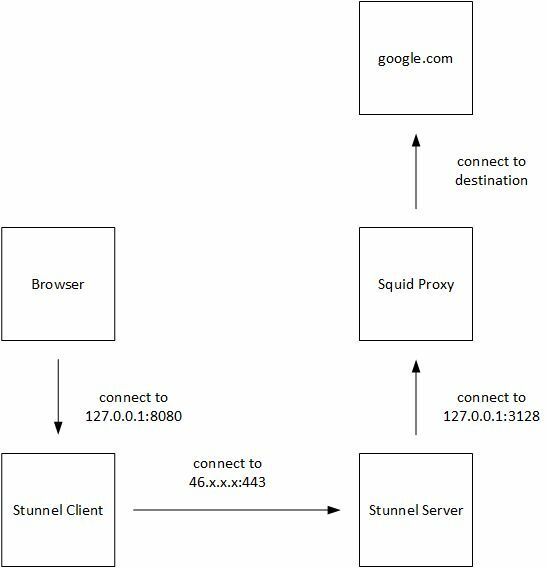 On the server, the traffic leaves the tunnel, and the connection attempt of the client is directed to the Squid proxy, which listens on 127.0.0.1:3128 for connections. Summarized, my browser connectes the Squid proxy on my FreeBSD host over a TLS encrypted connection. Stunnel and Squid can be installed using pkg install . The configuration files are located under /usr/local/etc/stunnel and /usr/local/etc/squid. After the installation of stunnel, an additional directory for the PID file must be created. Stunnel is not running with root privileges, thus it can’t create its PID file in /var/run. The stunnel.conf is pretty simple. I’m using a Let’s Encrypt certificate on the server-side. If you like, you can create your own certificate using OpenSSL. But I prefer Let’s Encrypt. The psk.txt contains the pre-shared key. The same file must be located on the client-side. The file itself it pretty simple – username:passphrase. Make sure that the PSK file is not group- and world-readable! The squid.conf is also pretty simple. Make sure that Squid only listens on localhost! I disabled the access log. I simply don’t need it, because I’m the only user. And I don’t have to rotate another logfile. Some ACLs of Squid are now implicitly active. There is no need to configure localhsot or 127.0.0.1 as a source, if you want to allow http access only from localhost. Make sure, that all requests are only allowed from localhost! To enable stunnel and squid in the /etc/rc.conf, add the following lines to your /etc/rc.conf. The stunnel_pidfile option tells Stunnel, where it should create its PID file. Make sure that you have initialized the Squid cache dir, before you start squid. Initialize the cache dir, and start Squid and Stunnel on the server-side. On the client-side, you have to install Stunnel. You can fine installer files for Windows on stunnel.org. The config of the client is pretty simple. The psk.txt contain the same username and passphrase as on the server-side. The file must be located in the same directory as the stunnel.conf on the client. Start Stunnel on your client and configure 127.0.0.1:8080 as proxy in your browser. If you access https://www.whatismyip.com, you should see the IP address of your server, not the IP address of your local internet connection. You can check the encrypted connection with Wireshark on the client-side, or with tcpdump on the server-side. Please note, that the connection is only encrypted until it hits your server. Traffic that leaves your server, e.g. HTTP requests, are unencrypted. It is only an encrypted connection to your proxy, not and encrypted end-2-end connection. This entry was posted in Software and tagged freebsd, linux, networking, security, unix on May 4, 2017 by Patrick Terlisten. The downside of using WordPress is that many people use it. That makes WordPress a perfect target for attacks. I have some trouble with attacks, and one of the consequences is, that my web server crashes under load. The easiest way to solve this issue would be to ban those IP addresses. I use Fail2ban to protect some other services. So the idea of using Fail2ban to ban IP addresses, that are used for attacks, was obvious. Fail2ban scans log files (e.g. /var/log/apache/error_log) and bans IPs that show the malicious signs — too many password failures, seeking for exploits, etc. Generally Fail2Ban is then used to update firewall rules to reject the IP addresses for a specified amount of time, although any arbitrary other action (e.g. sending an email) could also be configured. Out of the box Fail2Ban comes with filters for various services (apache, courier, ssh, etc). That works for services, like IMAP, very good. Unfortunately, this does not work out of the box for WordPress. But adding the WordPress plugin WP fail2ban brings us closer to the solution. For performance and security reasons, vcloudnine.de can only be accessed through a content delivery network (CDN), in this case CloudFlare. Because CloudFlare acts as a reverse proxy, I can not see “the real” IP address. Furthermore, I can not log the IP addresses because of the German data protection law. This makes the Fail2ban and the WordPress Fail2ban plugin nearly useless, because all I would ban with iptables, would be the CloudFlare CND IP ranges. But CloudFlare offers a firewall service. CloudFlare would be the right place to block IP addresses. So, how can I stick Fail2ban, the WP Fail2ban plugin and CloudFlares firewall service together? APIs are the solution for nearly every problem. Like others, CloudFlare offers an API that can be used to automate tasks. In this case, I use the API to add entries to the CloudFlare firewall. Or honestly: Someone wrote a Fail2ban action that do this for me. First of all, you have to install the WP Fail2ban plugin. That is easy. Simply install the plugin. Then copy the wordpress-hard.conf from the plugin directory to the filters.d directory of Fail2ban. Then edit the /etc/fail2ban/jail.conf and add the necessary entries for WordPress. Please note, that in my case, the plugin logs to /var/log/messages. The action is “cloudflare”. To allow Fail2ban to work with the CloudFlare API, you need the CloudFlare API Key. This key is uniqe for every CloudFlare account. You can get this key from you CloudFlare user profile. Go to the user settings and scroll down. Open the /etc/fail2ban/action.d/cloudflare.conf and scroll to the end of the file. Add the token and your CloudFlare login name (e-mail address) to the file. The reason for this can be found in the FAQ of the WP Fail2ban plugin. The IP ranges used by CloudFlare can be found at CloudFlare. Seems so… This is an example from /var/log/messages. And this is a screenshot from the CloudFlare firewall section. Important note for those, who use SELinux: Make sure that you install the policycoreutils-python package, and create a custom policy for Fail2Ban! Make sure that you create a custom policy for Fail2Ban, and that you load the policy. This entry was posted in Automation and tagged automation, blog, linux, security, server on January 15, 2017 by Patrick Terlisten. As a frequent reader of my blog, you might have noticed that vcloudnine.de was unavailable from time to time. Reason for this was, that my server was running out of memory at night. Running out of memory is bad for system uptime. Sometimes you have to sacrifice someone to help others. It is the job of the linux ‘oom killer’ to sacrifice one or more processes in order to free up memory for the system when all else fails. The OOM killer selects the process, that frees up the most memory, and that is the least important to the system. Unfortunately, in my case it is Apache or MySQL. On the other hand: Killing these processes have never brought back the system to life. But that is another story. Something has consumed so much memory at night, that the OOM killer had to start its deadly work. The OOM has started its work at ~5am, and it killed the httpd (Apache). While checking the Apache error_log, this log entry caught my attention. The next stop was the Apache access_log. At the same time as in the error_log, the Apache logged a POST request wp-login.php in the access_log. And there were a lot more attempts… I did a short check of older log files. It was not the first OOM killer event, and the log entries were smoking gun. Especially the POST for wp-login.php. The number below the command is the number of the POST requests logged in the access_log. The current access_log starts on Jan 08 2017. And since start, there are alreay 876 POST requests to wp-login.php. Looks like a brute force attack. So there is nothing wrong with the sever setup, it simply breaks down during a brute force attack. This entry was posted in Software and tagged blog, linux, security, wordpress on January 14, 2017 by Patrick Terlisten. By default, CentOS 6 comes with Python 2.6. This is a bit outdated, especially if you take into account, that Python 2.7.11, which is the latest Python 2 release, was released in December 2015. If you are new to Pyhton, you will usually start with Python 3. Currently, Python 3.5.1 is the latest Python 3 release. So, Python 2.6 is REALLY old. Okay, I could use another distro. Ehm… no. CentOS is the is the open-source version of Red Hat Enterprise Linux (RHEL). It was, and it is, designed to be similar to RHEL. CentOS runs only the most stable versions of packaged software. This greatly reduces the risk of crashes and errors. The downside is… Python 2.6. Or Apache 2.2. Or MySQL 5.1. Switching to CentOS 7 is difficult, because there is no inplace upgrade. In my case, I needed Python 2.7. Fortunately, this package is offered by the Software Collections ( SCL ) repository. You can install Python 2.7 with two commands. After the successful installation of the packages, you can find the files located under /opt/rh/python27. Next step is to create a python.conf under /etc/ld.co.conf.d and run ldconfig afterwards. Last step is to create a symlink for the Python 2.7 binary. If you want to use Let’s Encrypt with CentOS 6, make sure to use Python 2.7. This entry was posted in Software and tagged centos, linux, python on June 25, 2016 by Patrick Terlisten. Over the last weeks, I’ve tried to improve the performance of my blog. The side was very slow and the page load times varied between 5 and 10 seconds. Much too long! I’ve reduced time consuming plugins, checked the size of pictures, checked CSS and HTML for misconfiguration/ slow clode and tuned the database. The page load times have not really improved. Yesterday, I checked the httpd.conf on my webserver and found a little typo (accidentally commented line). After a restart of the Apache webserver, the page load times have dramatically improved (down to 2 – 3 seconds). What had happened? These benefits are even more important, if you use HTTPS connections (and vcloudnine.de is HTTPS-only…), because each new HTTP connection needs much more CPU time and round-trips compared to an unsecure HTTP connection. This little picture clarifies the differences. If you’re using Apache, you can enable HTTP keep-alive with a single line in the httpd.conf. Further information can be found in the documentation of Apache (Apache webserver 2.2 and 2.4). This entry was posted in Server and tagged apache, blog, httpd, linux, networking, oss on June 24, 2016 by Patrick Terlisten. Yesterday I’ve updated a CentOS 6.6 VM with a simple yum update. A couple of packages were updated and to be honest: I haven’t checked which packages were updated. Today I noticed that an application, that uses a secure tunnel to connect to another application, doesn’t work. While browsing through the log files, I found this message from Stunnel. I rised the debug level and restarted Stunnel. Right after the restart, I found this in the logs. So Stunnel was working in FIPS mode. But what is FIPS and why is Stunnel using it? I recommend to read the Wikipedia article about the Federal Information Processing Standards (FIPS). To be precise, Stunnel follows FIPS 140-2. My stunnel.conf is really simple and there’s nothing configured that is, or might be related to FIPS. A short search with man -K fips led me to the stunnel man page. Enable or disable FIPS 140-2 mode. This option allows to disable entering FIPS mode if stunnel was compiled with FIPS 140-2 support. After a restart of Stunnel on the server-side, the connection began to work again. This entry was posted in Software and tagged centos, linux, security on February 4, 2015 by Patrick Terlisten. The inbound SMTP connections are distributed to two Mail Transfer Agents (often a cluster of appliances, like Cisco IronPort or Symantec Messaging Gateway) and the MTAs forward the e-mails to the Exchange servers. Sometimes the e-mails are not directly forwarded to the Exchange servers, but to mail security appliances instead (like Zertificon Z1 SecureMail Gateway). After the e-mails have been processed by the mail security appliances, they are forwarded to the Exchange backend. Such setups are quite common. If a load balancer isn’t used, the MX records often point to the public IP address of a specific MTA. In this case, two or more MX records have to be set to ensure that e-mails can be received, even if a MTA fails. A setup with a load balancers allows you to have a single MX record in your DNS, but two or more servers that can handle inbound SMTP connections. This makes maintenance easier und allows you to scale without having to fumble on the DNS. It’s without saying that your Load Balancer should be highly available, if you decide to realize such a setup. 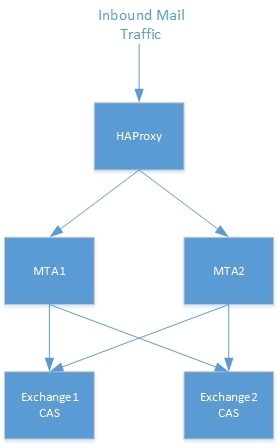 It’s not hard to persuade HAProxy to distribute inbound SMTP connections. All you have to do is to add this to your haproxy.conf. 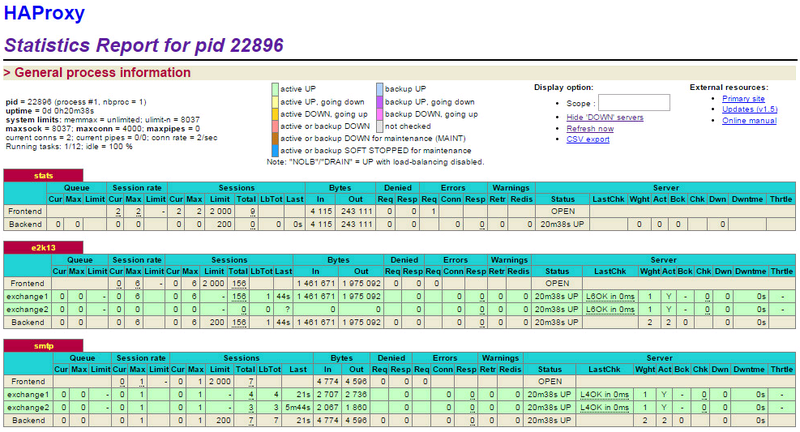 To get the full config, check my last blog post about HAProxy. This option add support for the PROXY protocol. Incoming requests are distributed alternating to the servers behind the load balancer. The “balance roundrobin” parameter ensures this. Please make sure that the MTA, that is running on your Linux host, doesn’t listen on the external IP. In my case, Postfix listens only on 127.0.0.1. The statistics page can be used to verify the success of the configuration (click the picture to enlarge). Alternatively you can use Telnet to connect to the load balancer on port 25/tcp. As you can see in the screenshot, using the FQDN mailin.vcloudlab.local resulted in an alternating connection to the backend servers. This entry was posted in Software and tagged exchange, linux, mail, microsoft, networking, server on January 11, 2015 by Patrick Terlisten.